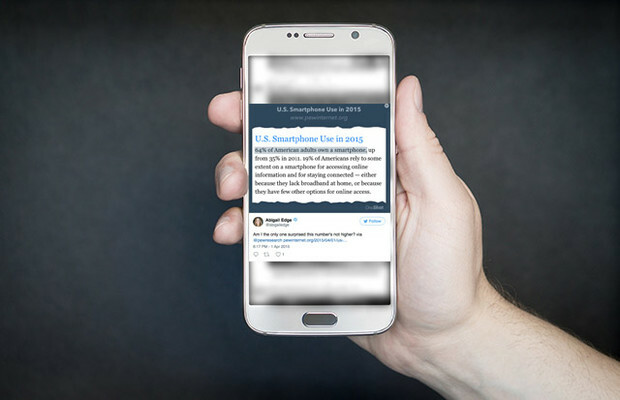 Journalists share articles every day, whether to promote their own work or draw attention to that of another, but simply sharing a link can go unnoticed – your post will be far more engaging if you share a screenshot highlighting the most salient part. You could always awkwardly do this within your phone's browser, but you may be sweating by the time you've managed to keep the section highlighted while using two fingers to press two buttons and screenshot before cropping. For an easier way to share a snippet of an article's text to social, check out these apps below. 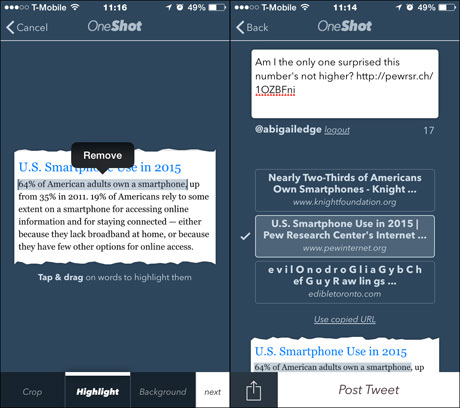 Excerpt (£0.99) allows journalists to quote text manually or from any app and share directly to social media. When you're reading an article and come across a part of the text you'd like to post to your followers, simply highlight it and share it to the Excerpt extension. A preview screen will appear, where you will be able to customise how you would like your pull quote to look. Alter the ribbon colour, background hue and font type, add a time stamp and even your own custom branding (this can be purchased for an additional £0.99 in the app settings). Save your favourite formats for continuity if sharing on your publisher's account, or just for a faster experience with your branding next time. 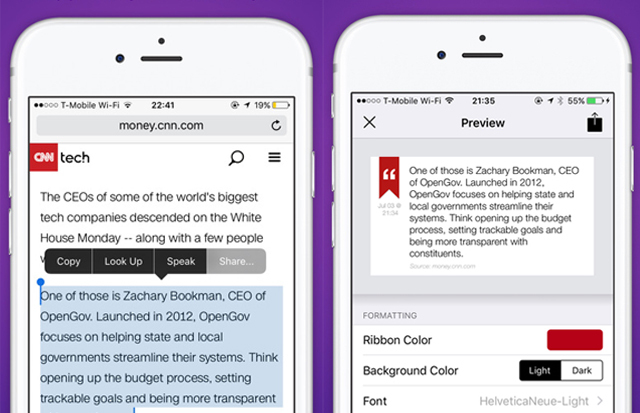 Edit the source of your section by copy and pasting the URL into the app, and share to the platform of your choice. You can even keep a full history of everything you’ve quoted within the main app for easy re-sharing in the future. Sign up with your email, Facebook or Twitter details to get started with this free app, and follow the on-screen instructions to make sure Liner is enabled as one of the sharing options in your mobile browser. 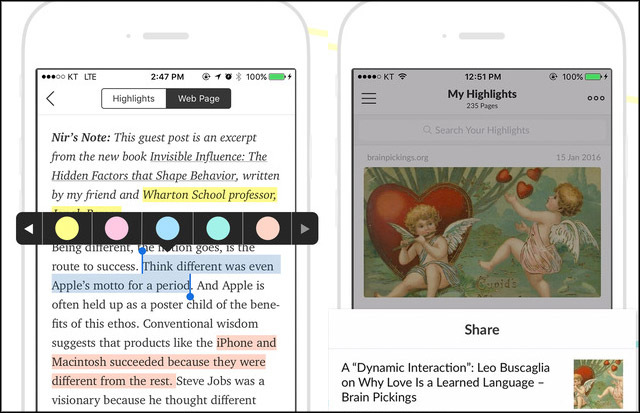 When you'd like to highlight a section from an article, tap the share button on the screen and select 'LINER highlighter' to save the web page to the app. Open Liner, and choose the article you've just sent there. Simply drag your finger across the screen to select a portion of the text, tap the share icon, and select the colour that you'd like to highlight the text. To differentiate multiple portions of the same article, highlight with different colours. You can even add comments to these portions, which can be shared with your followers as well. You can then post of a screenshot of your highlights directly to social media. Your highlights will be collated within the app, making it a great way to keep the articles that interest you in one place. Free app OneShot requires users to take a screenshot of the text, before opening up the app and selecting the screenshot they just took. You can then crop the picture, highlight the text you're interested in and choose the background colour – this can all be done within about two minutes, so ideal for journalists in a rush. The app automatically finds options for the source URL for your screenshot, which you can confirm by tapping the correct one before it goes out to your followers. You can always paste it in if you'd like to control this for yourself. Publish directly to social media in a Twitter or Facebook post, or save to their phone's camera roll. As always, when sharing screenshots to social media, ensure you include a URL to show where the text is from, allowing your followers to go in and read the article themselves for more context.